Vanquish. This sliding is what you do in the game pretty much all the time, even if the the actual in-game position is more outrageous. 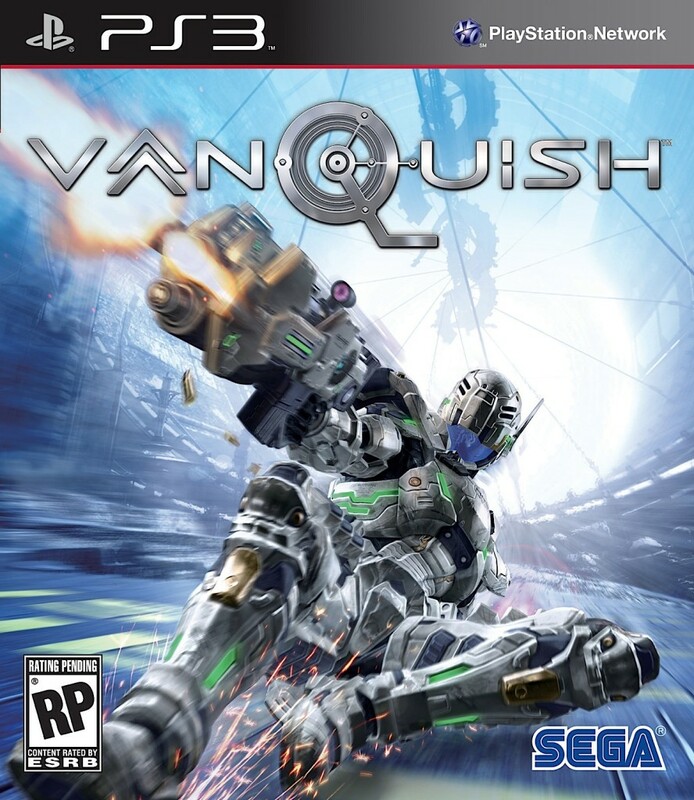 I thought Vanquish was the most impressive game at E3 2010, and promptly forgot about it for the following years. I only got into it thanks to it being featured as a free title on PlayStation Plus. Turns out my initial impressions were right, and also that they are somewhat worrying in today’s videogame market. Vanquish really is an impressive game. On purely the level of spectacle, the audiovisual show on offer is top shelf. This easily stands up to something like Halo and Gears Of War as action entertainment. Indeed, as an action title, it is in very rare company as an impeccably designed skill game. Vanquish is like I imagined the videogames of the future would be, as a child pounding away obsessively at his Commodore 128D. If you take a game like Turrican (1990) and just keep upping the graphical fidelity and control scheme, what you end up with is Vanquish. It is a demanding, relentless game that presents itself as a challenge. You are required to learn how it plays and use all the tricks it gives you to overcome what it throws at you. As another wave of killer robots advances on you, you can almost hear the game’s director, the esteemed Shinji Mikami asking “are you having fun yet?”. Unlike something like Gears, the enemies don’t much change, but the pacing keeps things refreshing. Nothing gets in the way of playing the game, which is really welcome in today’s overly hand-holding gaming space. From the opening camera pan to the initial menu selections, Vanquish throws you into the deep end and asks you to swim. Pauses in the fighting are not drawn-out affairs – Marcus Fenix walking slowly with your hand to your ear, I’m looking at you – but quick breaks to merely tell you that you’ve survived the challenge and are going to enter the next one in a few seconds. The second the action ends, the hero lights up and asks “where do I go next?”. There is no pretension of character drama and only the lightest of facades that suffices for motivation. It is the EVIL WALRUS STOLE YOUR FRIENDS of the modern age. RUSSIAN ROBOTS ON RAMPAGE, go make a mess. The setting and cast are glorious. You are a DARPA prototype test man attacking a Russian robot force that’s taken over a colony cylinder in Earth space. As settings go, it is a triumph: it’s believable, huge yet easy to understand and ready to be blown to bits. Its off-white hues delineate everything in easy to process shapes and channels. As a game space, it shines. You accept ever more ridiculous robot bosses rising from its depths at face value. It is the tightly edited 1980s action movie in a world of bloated blockbusters more concerned with being “entertainment” and “value” than being out and out spectacular games. You don’t need anything but the lone hero against an army of killer robots. Just keep upping the tempo and the speed and things will sort themselves. Gameplay is of the “take a formula that works and tweak one single thing” school of design. You’re basically playing a cover shooter in the vein of Gears Of War, but instead of the impossible to direct, protein-powered charge-through-anything-in-your-way style “roadie run” to move between cover, you get… entirely reckless ankle rockets. Press L2 to boost and the hero drops on his knees, leans back and rockets forward. It’s reminiscent of water slides and snowboarding and skating, except at stupid speeds. The boosting is so much fun you do it all the time, even if only to move a couple of meters. This joy of movement is further evoked by your dodge move which is a flamboyant somersault. When you’re out of rocket juice, what you do is somersault all over the place, more often than not under heavy rocket fire. It’s glorious, and what happens is you never just walk or run around. Getting around becomes the lizard-brain satisfying activity, not shooting. You laugh at outmaneuvering your foes at rocket speed and (rocket) punching them in the face instead of lining up shots. If I were to criticize something, the weapons are not very interesting or satisfying. There’s some joy in figuring out how they work, but nothing really compares to rocket punching guys up into the air. Vanquish is an excellent game and we should cherish it. I can’t help but think that games like it are becoming more elusive by the year.